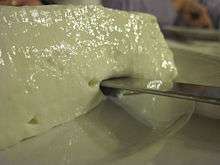 Stracchino (Italian pronunciation: [strakˈkiːno]), also known as crescenza (Italian pronunciation: [kreˈʃɛːntsa]), is a type of Italian cow’s-milk cheese, typical of Lombardy, Piedmont and Veneto. It is eaten very young, has no rind and a very soft, creamy texture and normally a mild and delicate flavour. It is normally square in shape. Stracchino is usually eaten on its own but also as a filling for some kinds of bread: in Recco, on the Ligurian riviera east of Genoa, focaccia col formaggio ("cheese focaccia") or focaccia di Recco is typically filled with crescenza, while in Romagna and in parts of some nearby regions (e.g. northern Marche, Umbria and eastern Tuscany) it is a common filling for piadina.